Weather flyers are a great way of giving your guests or customers the latest local weather information. Our free, printable Tyler Texas Weather Flyer is updated continuously throughout the day so that you always print the latest local weather information. Our flyer is great for use by Tyler Area hotels, motels, restaurants, businesses, government offices and individuals to distribute to their patrons. 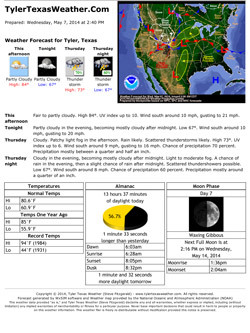 The Tyler Texas Weather flyer prints in full color (color printer required) and is designed to show the immediate forecast for the next 36 hours along with other important weather information for the day. It also includes a weather map detailing upcoming weather systems. Click here to open the weather flyer. The flyer will open in a new window. Select File then scroll down the menu and click on Print Preview. In the Page Setup box check to be sure that all drop-downs indicate Empty under both Headers and Footers and that all Margins are set to 0.5 inches. Click the Print Document icon. The flyer will print on a single page. If you find the flyer useful, please contact us, we would be happy to know. Tyler Texas Weather also offers customized Weather Flyers for a small annual fee. Our custom flyers can include your company, business logo, or letterhead and/or custom weather data that your patrons will find most useful. For complete information on our customized weather flyers, including rates, please contact us with your ideas and specifications.